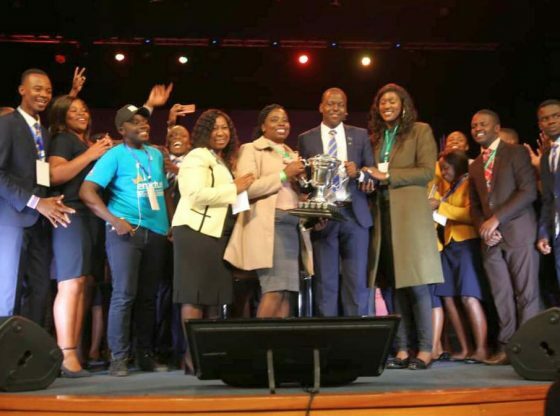 The Midlands State University (MSU) Boost-Enactus team were crowned as the 2018 National Champions after successfully defending their title at the Boost-Enactus National Competitions held at the Celebration Centre, in Harare on Friday the 13th of July. The highly innovative and enterprising team of pacesetters presented two outstanding transformative and entrepreneurial projects to emerge victorious for the second time in as many years, ahead of the National University of Science and Technology (NUST) and Chinhoyi University of Technology (CUT) who finished second and third respectively. The MSU team, which also won the best sustainable development oriented project prize, as well as one thousand dollars in prize money, will now go on to represent both the University and Zimbabwe at the 2018 Enactus World Cup to be held in Silicon Valley; San Jose, California, USA from 9-10 October. Having had the distinct honour and privilege to represent the country at the 2017 Enactus World Cup competitions held in London last year, and narrowly losing to eventual 2017 World Cup winners India, in their semi-final league, the Midlands State University team will be looking to go all the way to the final league of the competition, this time around. On behalf of the Entire University community, we wish to congratulate the TeamMSU and wish them all the best as they prepare to rise both the Midlands State University and Zimbabwean flags high in Silicon Valley.